Growing up a young man in northwestern Ontario, fashion wasn’t something that was always on the top of my radar screen. My mother, however, had a natural sense of style and grace. She dressed well and always looked fantastic. She also made sure her oldest son was not dressed like a Raggedy Andy doll for school. In Grade 7, she was the only mother who sewed corduroy inserts into my bell bottoms. She also applied cool patches on my blue jean jacket and made sure shirts had flowers and other ornate designs. So it’s possible my interest in fashion came from her, at least in part. So how did camouflage become a “thing” in fashion? I can only speak from my experience, and that’s very much a Canadian point of view. In the mid to late 1980s, the media boom in both fishing and hunting was well underway; television, magazine and videos were everywhere. The people in the shows and on the pages were often wearing camouflage. It started to feel ok to want it. In 1986, I bought my very first reversible camouflage hunting jacket. It had old style green “jungle camo” on the outside and blaze orange on the inside. This became my fishing and hunting jacket, and even made a few magazine covers. Over the next decade, the camouflage fabric and clothing market exploded and soon adorned all types of outdoor wear. At the same time, camo began to make a subtle creep into the regular fashion industry. For the most part, the camouflage clothing fashion rage started with things like shorts and t-shirts. Musicians and especially rappers embraced camouflage clothing early, and kids began wearing it. I’ll never forget in the early 1990s, driving down Red River Road in Thunder Bay, and seeing a lovely young woman bundled up in a snow camo jacket and red mini skirt. It was something to see. Then, about a decade ago, my fashionable colleague at CBC radio in Thunder Bay, Lisa Laco, showed up at the station with a very trendy camo skirt on. Camo was in fashion. These days, seeing camouflage clothing on the street, or even when out for dinner, does not merit a head turn. The stuff is literally everywhere. This past summer, at the Thunder Bay Blues Fest, I’d guess that 1 out of 4 people in the crowd had some manner of camo on, whether it was shorts, a t-shirt, ball cap or bandana. A recent cursory glance through the racks at Intercity Mall in Thunder Bay revealed a mind boggling array of designer camouflage clothes. Some of the stuff was pretty cool. The digital camo designs are especially unique and are found in every colour under the rainbow. Even Sears has joined the party. While doing some research for this piece, I found a beautiful pair of chinos in a very nice late fall camo pattern there. Yes, I bought them. There are many company’s now that make camo-styled clothing that really is not meant for anything but wearing out on the town. Or the bedroom. A quick Google search of “camo lingerie” will open even the most jaded eyes to the unique possibilities camouflage can offer. A couple of years ago, at a lodge near Red Rock, I stumbled upon a group of young women dressed to the nines in wedding and bridesmaid apparel. 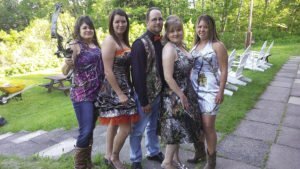 They were taking part in a photo shoot for the Thunder Bay based company “Canadian Camo Divas.” The wedding clothing was cut traditionally enough, except for the liberal use of pink, black and green camouflage. The women looked smashing. Not long after that, I co-hosted an event in Thunder Bay called the camo formal. It was a fund raiser for the Canadian Mental Health Association. People were invited to wear camouflage clothing to the dinner and there was also a fashion show. The fashions on display all included camouflage accents. The lovely co-host Mary Jean Cormier wore a sleeveless dress accented with a camouflage sash. My formal look was set off with a shimmering camo vest. These days, slipping on a waterfowl jacket with bullrushes on it feels like getting dressed for work. The exotica of camouflage is no more, it is now just another part of modern culture. The times have truly changed.